The Voigtlander Nokton 17.5mm F0.95 lens for micro four thirds compact system cameras is the second ultra speed F0.95 lens manufactured by Voigtlander for micro four thirds system. 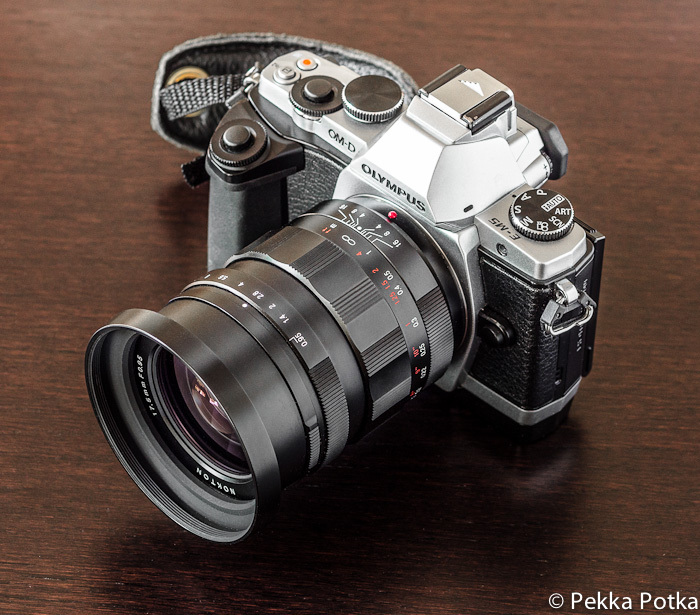 Photography website pekkapotka.com has just reviewed this prime lens and their conclusion is that it is one of the best prime lens available for micro four thirds compact system cameras. However using such lens requires mastering manual focusing skills and excels best at street photography, low light photos and video. The Voigtlander Nokton 17.5mm F0.95 Lens is the heaviest of the native micro four thirds lens weighing 540 grams and with a lens barrel made of metal and comprised of 13 different glass optical elements. This prime lens is manual focus only but it is a joy to use as its focusing ring is easy to handle. The smallest focusing distance of this lens is of 15cm which enables photographers to take up close photos with a 1:4 magnification ratio. It is not a dedicated macro lens but it is able to offer versatile near macro photos specially when wide open at F0.95. Due to the 2x crop ratio of micro four thirds sensors the Voigtlander Nokton 17.5mm F0.95 Lens provides a full frame equivalent view of a 35mm lens with a depth of field equivalence of F1.8. A nice touch of this lens is that it also comes with a depth of field scale engraved in lens right after the distance scale making it easier for photographers to use zone focusing techniques when taking photos. This is specially useful when shooting street photography. With an aperture of F5.6 and focusing at a distance of 2.5 meters it is possible to get a focused area from 1.5 meters till 8 meters ahead. In terms of sharpness this lens reaches its prime at about F4.0-5.6 in both corners and center. Some barrel distortion is visible at corners at wider apertures though this can be corrected during post processing. Due to the ultra fast nature of this lens it is not advisable to use it beyond F8 as image quality starts to degrade fast. This ultra fast lens from Voigtlander was made thinking also of video shooting. Its focusing ring is butterly smooth and easy to use both aperture and depth of field during video shooting. Although this lens has a native micro four thirds mount there is no electronic parts which means no EXIF information is recorded and the IBIS of the Olympus OM-D E-M5 does not work at its full capacities as a result of this.